TheLightBulb work in partnership with the Education and Skills Funding Agency (ESFA) and the European Social Fund (ESF) to deliver funded Apprenticeship programmes across a range of industry sectors throughout Thames Gateway and Essex. 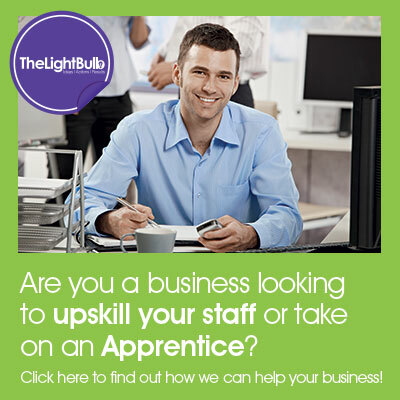 Whether you are a business looking to upskill your existing employees, or take on a new team member, or you are an individual looking for a programme that offers not only a set of qualifications but a career path TheLightBulb have an apprenticeship scheme for you. To find out more information on what we can offer you please choose the purple route above if you are a learner or the green one if you are an employer. Alternatively give us a call on 01268 270648, email [email protected] or complete an enquiry form if you want us to contact you. 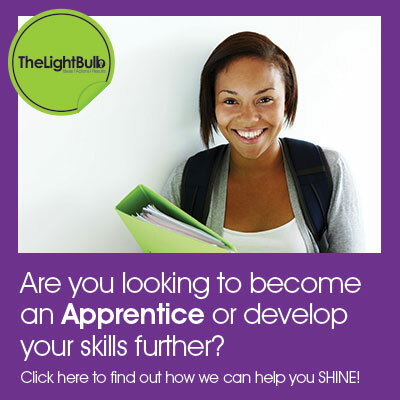 If you need support before taking an apprenticeship then let TheLightBulb help you with our Traineeship programme. Are you aged 16 – 23? Currently struggling to find employment? Do you need real work experience and the chance to develop new skills? If the answer is YES to any of the questions above, then a Traineeship with TheLightBulb is the way forward for you. Funded by the ESFA and the ESF, a Traineeship is designed to get you ready for employment and give you that all important chance to work with a reputable employer for 6 to 10 weeks and is aimed to help young people who are focused on getting an Apprenticeship or sustainable job but who do not yet have the skills, confidence or experience to compete successfully for vacancies.